The 7KT266A is based on - if you haven't guessed already - VIA's KT266A chipset. For expansion, it has one 4x AGP slot, five PCI's and one ACR slot. Even though the regular consumer will never use the ACR slot it is at least placed in a good position, right next to the AGP slot. With all those 3rd party aftermarket heatsinks for videocards, you don't have to feel bad because you're no longer loosing a PCI slot! Onboard audio is taken care of via VIA's AC'97 codec, but don't get too excited, it's not really that great. 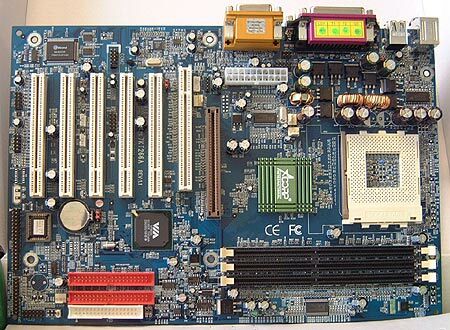 This is a value market orientend motherboard and dropping in a C-media chip would raise the costs. So if you're a audiophile or gamer, do yourself a favour and get a hardware based soundcard. If you don't care much about audio, and only really want beeps, or if you're still using those $10 speakers that came with your current system, then the onboard audio is just fine. On our list of things we would have like to seen, the main one is active cooling on the "Northbridge", rather than just the green heatsink attached via a measly thermal pad. As for the layout of the 7KT266A, it's pretty plain, everything is where you expect it to be. However, I don't like the placement of the IDE and floppy drive connectors. Being that low, they rules out the possibility of using full length cards in the mid-lower PCI slots. Also, if you're using a longer AGP card like the Voodoo5 5500, it's quite a hassle to wrap the cables around the videocard. A rather plain but effective Award BIOS awaits you. 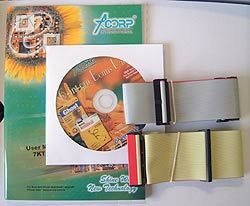 Here are the more interesting parts for your browsing pleasure. Again, it's important to remember that is a value board (value = inexpensive for those who don't know). 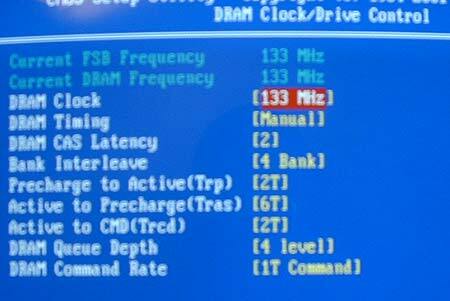 Still, there are quite a few memory tweaks for you to play around with and the FSB adjustments do allow 1 MHz increments which is standard these days. It's really a shame that the 7KT266A lacks multiplier adjustments and voltage control. Oh well, you can't win them all for USD$90. This was a nice touch, seems more and more motherboard manufacturers are doing this now. Having the PC Health show at POST is a good idea, that way, you can keep an eye on the voltages or temperatures just in case something is wrong right at boot up. As for overclocking even though my AMD Athlon XP1800+ was unlocked, there wasn't much I could do. There was no way to make multiplier or voltage adjustments and the highest I could push the FSB was up to 143 MHz. It's not bad, but not great either. Hopefully in future BIOS update ACorp will allow a little more tweaking by their consumers.